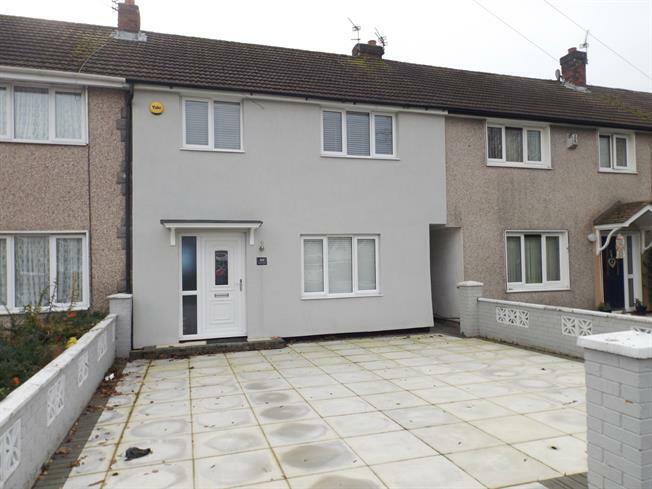 3 Bedroom Terraced House For Sale in St. Helens for Asking Price £95,000. Perfect first home!! Spacious and fully refurbished, this three bedroom terraced home in Blackbrook, St Helens is close to the East Lancs with links to Manchester and Liverpool. Offered with no chain the property comprises of entrance hall, a spacious through lounge with french doors leading to the rear garden and a newly fitted Howdens kitchen. To the first floor are three good sized bedrooms and a modern three piece bathroom suite. Externally there is a large rear garden, the front is flagged for off road parking for multiple vehicles. Please contact 01744 21962 to arrange a viewing. UPVC front double glazed door. Double glazed uPVC window with frosted glass. Radiator, laminate flooring, under stair storage. UPVC back double glazed door, opening onto the garden. Double glazed uPVC window. Radiator, tiled splashbacks, ceiling light. Roll top work surface, wall and base units, stainless steel sink and with mixer tap, integrated, electric oven, integrated, gas hob, over hob extractor. UPVC French double glazed door, opening onto the garden. Double glazed uPVC window. Radiator, laminate flooring, painted plaster ceiling, ceiling light. Double glazed uPVC window. Heated towel rail, part tiled walls, painted plaster ceiling, spotlights. Low level WC, panelled bath with mixer tap, vanity unit and top-mounted sink with mixer tap.